The ultimate snorkel and rafting adventure! Dolphins, turtles, sea caves, remote snorkeling sights including La Perouse Bay and up to 3 Molokini snorkel spots including the backside of Molokini. Trip includes breakfast, lunch, beverages and snorkel gear. The Kanaio Coast and Molokini Tour offer an opportunity to explore a rarely seen part of Maui, The Volcanic Kanaio Coast and a variety of remote exotic snorkeling sites, including both spinner dolphin and green sea turtle habitats. Passengers can expect a rare treat as they tour along Maui's Gold Coast past Wailea and Makena to a remote and inaccessible coastline with spectacular views of the slopes of Haleakala. About 200 years ago at Kanaio, molten lava exploded from a side vent and poured into the ocean forming incredible lava arches, grottos and sea caves. Experience entering a sea cave by raft or passing through a massive lava arch (conditions permitting)! Photographers will delight with the array of unique formations that await at every turn. Cruise the protected waters of La Perouse Bay where we frequently encountering schools of spinner dolphins, including babies, along the way or in the bay itself. Named for their acrobatics, these playful mammals will frolic in the waves produced by our boat sometimes only a few feet from the bow! On many occasions, our snorkelers have been approached by the dolphins while in the water. This is a visual and auditory experience that one never forgets! 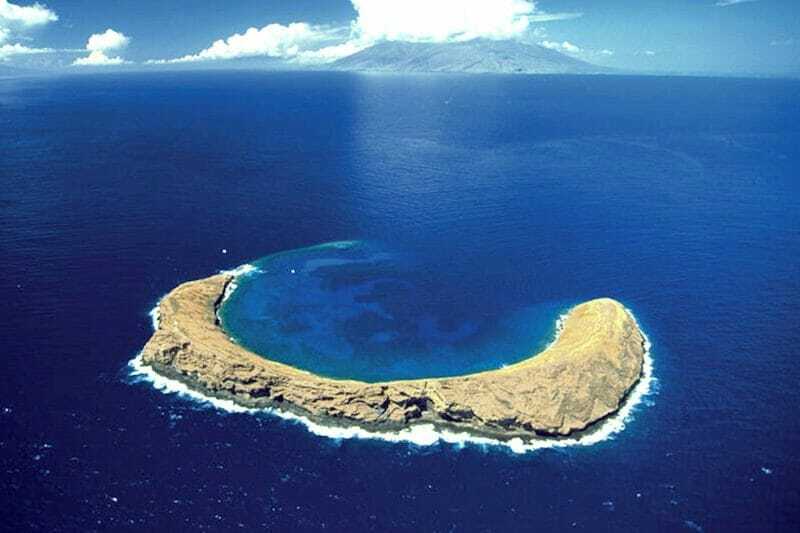 Molokini is a short 20-minute ride from La Perouse bay. There we will generally offer up to three unique sites including the inside rim, the outer reef and the back side of the crater. By this time of the day conditions at Molokini are generally calm and most of the bigger boats have departed or are departing leaving plenty of room for uncrowded snorkeling. Drift snorkeling the outer reef is one of the many highlights of this tour. Imagine snorkeling one of the most beautiful coral reefs in the world drifting gently along with the current as your boat follows nearby for your safety. Glide past a variety of butterfly fish, wrasses, black and pink tailed surgeons, all posing against a backdrop of beautiful coral only 3 feet below. For an exciting panoramic view, venture over to the edge to witness an awesome 200 ft. drop. It’s like looking off the edge of the world! 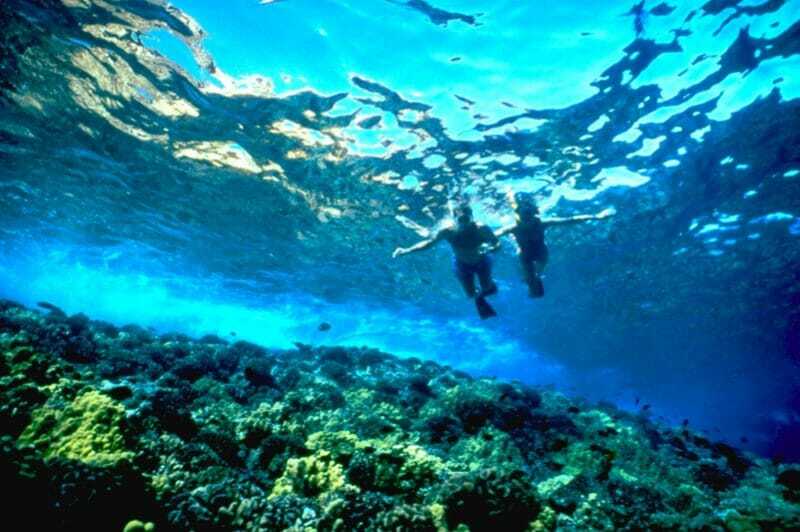 Time and conditions permitting, another drift snorkel may be offered on the backside of Molokini, a favored dive site for advanced scuba divers. The depth here is about 300 ft. but the lighting and the view of the vertical wall of rock, coral and fish are phenomenal. This site may also be offered as an alternative to the inside under certain sea conditions. We make one more stop in Makena where we serve a delicious buffet lunch and snorkel with sea turtles and spotted eagle rays near pristine lava fingers. These turtles, although endangered and protected, are accustomed to seeing snorkelers and do not mind being photographed as they surface for air just a few feet away. Explore the sea caves and lava arches of Maui's remote and rugged Kanaio Coast on the most challenging and invigorating snorkeling adventure that Maui has to offer. Discover secret coves abundant with coral, colorful tropical fish, and exotic marine life. Breakfast on the Kanaio/ Molokini tour consists of assorted fresh island fruit, muffins, Hawaiian fruit juices, and bottled water. Lunch is deli style consisting of turkey and roast beef, veggies & dip, cheddar and Swiss cheeses, whole wheat buns, and condiments with a delicious homemade style chocolate chip cookie. Beverages are Hawaiian fruit juices and bottled water. Please note, we do not serve or allow alcohol on board. Tours depart rain or shine. Inclement weather conditions are usually temporary and rain gear is provided. Cancellations due to weather are extremely uncommon and all parties are instructed to appear at the boat ramp no matter what the current weather conditions. These tours are best reserved for those who are adventurous in spirit and in reasonably good physical condition. Destinations are weather permitting and alternate sites may be chosen. However, it is rare for us not to reach our destination whether it be Molokini or Kanaio. If the captain deems the conditions to be unsafe for departure, a full refund will apply. No shows are non-refundable. Please check in 30 minutes prior to departure. Unfortunately this may not be the tour for you. We can't accommodate pregnant passengers, fragile elderly, or those with back or neck problems. And there are no wheel chair accommodations or provisions for service animals. We took the combined Kanaio Molokini tour 5.5 hrs. Captain Joe was amazing, assistant Ben- not so much, kind of dull. Met at the dock in the AM- could have been a little more organized. Then boarded the small boat- amazing tour of the south part of the island and lava, detailed explanations throughout entire tour by Joe. Clearly he loves his job and passionate about Maui. After lava tour- muffins, drinks and fruit. We then snorkeled initially in the bay. beautiful fish and corral. Waves were intermittent but fun. Didn't get nauseous at all. Then Molokini- couldn't snorkel backside too rough, but along reef was some of the most amazing snorkeling we had done. Beautiful wall and drop off, 1000's of fish, all species, eels. Then off to turtles, saw numerous amazing turtles along another reef by the shore. All in all well worth the cost, will definitely repeat next time in Maui. We took the Kanaio/Molikini tour (5.5 hours) the first week in September with Captain Tim and Stephanie. They were professional but fun, and very enthusiastic for us to have a great morning with them. When we started, the water was extraordinarily calm, so we got a fantastic view of the lava cliffs and the coastline. By the time we got to Molikini, it was much rougher, and the crew made the best of making sure we got to snorkel safely by changing our plans slightly. In no way were we gypped, and we were happy to have great snorkeling in a location where we could enjoy it. The boat was clean, the lunch was good, and it was a really nice group on board. This cruise was good for snorkeling but also for the fine opportunity to see the coastline from the water and to hear about the history and geology and animals of Maui. Plus the boat leaves from the boat ramp in Kihei, a plus since we stayed in Kihei. Definitely a great experience and a good price for that experience. We went on the Kanaio / Molokini trip in March of 2018. The staff greeted us promptly at 6:30 at the boat launch and after a quick description and safety briefing we were on our way. Before you book this tour, note that they use small boats which give an intimate and up-close experience with the water. There is also limited space on the boat to keep things dry so make sure you pack accordingly. We then got into the boat with captain Larry and Spencer who treated everyone on the boat to a first class experience, great customer service and really good jokes. The first stop was to go and visit the lava flows of the Kanaio coast. During the trip to the flows we saw some whales which the captain stopped for to let the sightseers take pictures and view the whales, at which point we continued. Due to the small size of the boat, our captain was able to get up close and personal with the rock formations and gave a brief description of how the flows had formed. Following that was a light breakfast and some snorkelling in La Persouse Bay, with a nice reef. The next stop was to Molokini, where we snorkelled along the back wall with its deep, clear water, multiple ledges of coral, and a large school of fish near the surface. We were unable to snorkel on the inside of Molokini due to the weather conditions (the choppiness of the water inside the crater) however the Bluewater team was able to ensure that we were able to still see some great sights at Molokini. Next stop was along the coast near Makena, where we snorkeled a reef and were greeted by the sight of ~4 sea turtles, capping off the snorkelling portion of the adventure. The final stop was to another bay where a light lunch of sandwiches was served where we were given the opportunity to interact with Larry and Spencer and they told us more of the history of the area along with other sights to see on Maui. A quick return to the dock and a very professional and practiced method of disembarkation ended this trip very nicely. I highly recommend this company and tour to anyone who wants an intimate experience with great snorkeling and experienced, friendly staff.